PIMS – – Never Have Card Data Revealed To Your Business Again! Never ask for card details over the phone again! 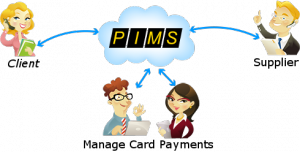 PIMS stands for Pay It My Self, and it refers to the client’s ability to enter his/her own debit/credit card details when payments have to be taken over the phone (i.e. card- not-present). Instead of exposing the client and your business to unnecessary risks by taking card details over the phone, PIMS will generate an email or SMS/text, to empower your clients to enter the card details on their personal computer, tablet or phone.